Suddenly, developing a mobile app is simple. Just 2 requirements and 4 steps, and you have a mobile app. No plugins; no software to install. Open a web browser and type the name or IP address of your groov as the URL. In groov Build, add the device you want to monitor or control. 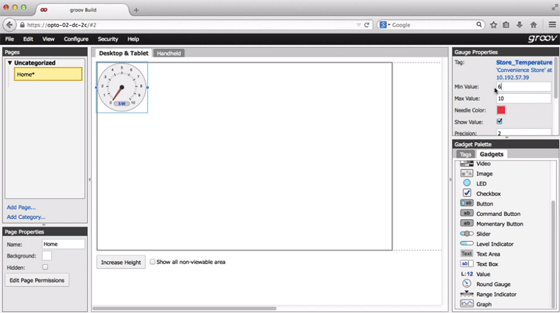 Drag and drop gadgets—indicators or controls—onto the screen. Tag the gadgets and save. No programming; no coding. No tag or user limits. Put a full-fledged HMI on your smartphone, and you won’t be able to use it. But put in just the data and controls you really need to use on mobile, and you’ll wonder how you ever got along without it. Because you develop the interface yourself, your mobile app includes only what you need. Keep it simple. If your interface is used on both larger and smaller screens, choose which gadgets to show on each. Give your authorized users access only to screens they should see. A technician may need to control part of a process, while a manager may only need production data. 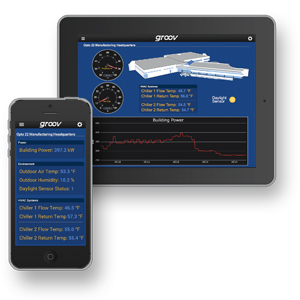 groov was designed on high-performance HMI principles, so the app you build is understandable and effective. To learn more about building effective operator interfaces, check out our white paper, Building an HMI that Works: New Best Practices for Operator Interface Design. It’s even easier to change your app, anytime you want. Save your changes and then just have users refresh their screens. Included with the GROOV-AR1 groov Box appliance is Node-RED, an open-source, cross-platform programming environment for wiring together hardware devices, cloud services, and APIs (application program interfaces). Requiring few programming skills, Node-RED on the groov Box can be your key to realizing the Industrial Internet of Things (IIoT) projects you’ve just thought about, until now. More about Node-RED. Monitor and control your equipment from anywhere using your smartphone or tablet. More on mobility. Manage Modbus/TCP devices, data from databases & APIs, Opto 22 SNAP PACs, and OPC UA systems and equipment. More on connectivity. See specs and system architecture diagrams.